So after 13 hours of play, our starting field of 126 entries has been cut to our final seven players who will return tomorrow to fight it out for the $32,760 top prize. There were plenty of swings and roundabouts along the way, but these are how our final table will look tomorrow – make sure you tune in to PokerMedia Australia to catch all the live action! 1.35am: Hong eliminated, final table set! Khac Tran opened UTG to 18,000 and Ryan Hong shoved for his remaining 140,000. Khac called with AQ and we were off to the races! Hong managed to fade the flop and was looking good for a double on the turn, but the rivered A was a disaster as the board ran out 57T8A to give us our final seven players! Theo Dharmasaputra opened to 20,000 and George Moussa shoved for another 66,000. Dharmasaputra called with KJ but was in bad shape against the KQ of Moussa. The turned Q cemented the win for Moussa who moves up to 150,000 while Dharmasaputra is left with just over 100,000! Shivan Abdine has out the foot down in recent hands, taking two tidy pots from Ryan Hong. In the first he check-raised a 236 flop to force a fold from Hong, then a few hands later he opened on the button before firing at the flop and turn on a J935 board with Hong again letting it go after tanking. Blinds are up to 4,000/8,000 with a 5,000 ante. The elimination of Sebesfi means we are now on the final table bubble! Play will now be hand for hand with one more to be sent packing before we call it quits for the night. We barely had time to blink following Horowitz’s elimination when David Sebesfi followed him to the rail! Sebesfi held KT and on a K-high flop but needed to fade plenty of outs against the flush draw and Ace over card of Ryan Hong. The turn was safe but the river gave Hong his flush and all of a sudden there were eight! Jacob Horowitz has just hit the rail after a big clash with Jason Sarkis. The action took place on a KJ2 flop with the money going all-in and Horowitz showing AK to find himself in trouble against the KJ of Sarkis. The turn and river blanked as Sarkis moves into the chip lead once more with around 400,000! It’s been a surprisingly quiet 30 minutes or so but that could all change with the blinds jumping to 3,000/6,000 with a 500 ante. There are 11 players remaining. Ryan Hong opened to 8,000 before Jason Sarkis 3-bet to 18,000. Hong thought briefly before putting Sarkis all-in for his remaining 130,000. This sent Sarkis deep into the tank and the floor staff eventually called the clock on him. With round five seconds remaining, Sarkis made the call and showed AQ to be racing for his tournament life against Hong’s 55. The 79JKA as Sarkis spiked his card on the river to get himself right back in contention. Players have returned to blinds of 2,000/4,000 with a 400 ante. That brings us to the end of Level 15 as the players head off for a short 10-minute break. Billy Argyros shoved with A9 and was called by Khac Tran with 77. The board ran out 888QT and Argyros is off to the cage! Minh Nguyen rose very quickly earlier today but he has fallen just as fast. Having leaked some chips to Shivan Abdine, he clashed with Jacob Horowitz holding 99 but needing help against TT. Ironically, both players found a set but Minh was always in trouble as the board ran out 3JT97. He hits the rail while Horowitz soars to almost 200,000. The bubble lasted just two hands before 2015 Sydney Championships winner Ben Jee became our bubble boy! A short-stacked Jee shoved for his last 42,000 with 44 and was called by Bassam Habib. The board ran out 6TK2J to out us in the money. The remaining 15 players are guaranteed a minimum of $2,520. Another short stack has fallen and we are now on the money bubble with 16 players remaining! Play will now be hand for hand until we make the money. Joel Cohen is our latest casualty after shoving his final 30,000 with K8 and finding a caller in David Sebesfi with AQ. Cohen jagged a K on the flop to take the lead but quickly lost it when an A landed on the turn. Sebesfi is now on 150,000 and is shaping up for another good result here following his final table finish in the Star Summer Series Main Event. The elimination of a short-stacked James Rann not only sees us down to 18 players, it also means we are rapidly approaching the bubble with 15 to make the money. Give there are currently three extremely short stacks, we’ll be interested to see how long they try to hold on! We raced over to Table 75 to see Bassam Habib stacking chips and an empty seat alongside. As Habib tells it, he opened to 5,000 with KQcc and was 3-bet by his opponent to 18,000. He made the call to see an AT3 flop. Both players checked the flop as well as the blank turn. However when a J landed on the river Habib’s opponent bet 18,000 then snap-called when Habib shoved. Habib is now chip leader with 220,000! Minh Nguyen continues to climb as we start to near the bubble and just sent Tim Manners to the rail in the process. Manners was short-stacked and shoved with QT as Minh made the call with A8. The board ran out AJ922 and the field was slashed to 20. Billy Argyros has enjoyed a slice of good fortune to more than double through and move to 85,000. After Jason Sarkis opened and one opponent called, Argyros re-raised to 20,000. Sarkis folded but his opponent shoved. Argyros called and showed QT to be racing against 88. The board fell 7KT59 and Croc scores the big double. Blinds are up to 1,200/2,400 with a 300 ante. We caught the action on the river with 17,000 in the middle and Minh Nguyen firing out a bet of 9,100 on a 7344K board after Jacob Horowitz checked. Horowitz tanked for around a minute before eventually making the call, only to muck when the 2014 ANZPT Auckland champ showed KT. Players have returned to blinds of 1,000/2,000 with a 300 ante. Michael Tran has quickly followed Chad Awerbuch out the door, meaning we are down to just four tables and 24 players remaining. Bassam Habib opened to 2,500 and Chad Awerbuch shoved for his remaining 17,000. Habib called to find his A5 in good shape against KJ. An A on the flop just about sealed the deal as Awerbuch hits the rail. Habib is now a real contender with 120,000. Sammy Lucisano got the last of his chips in holding JT against the 99 of his opponent. He was looking good on the 3K5J board until a 9 spiked on the river to send him to the rail. There are 26 players remaining. We found Michael Tran sitting in a new seat but with just a few chips in front of him, which he explained was a result of having lost two big hands before being moved to a different table. He wasn’t ready to go home just yet though, getting it in with Q9 suited against the AJ of Sammy Lucisano and spiking a 9 on the river to move back to 35,000. Lucisano is now one of the extreme short stacks with just 15,000 behind. Blinds are up to 800/1,600 with a 200 ante. Short stacks Errolyn Strang, Michael O’Grady and Matt Rolfe have all hit the rail in the past 10 minutes as we reach our final five tables! 8.05pm: That’s a large bet! After George Moussa opened UTG then folded to David Sebesfi’s re-raise, he found himself involved in the next hand against Joel Cohen. Moussa checked the 9T6 flop but quickly announced he was all-in after Cohen bet 4,000. Cohen announced he held AT as he mucked his cards with Moussa sportingly showing his 9T for top two. James Rann was all-in for his last 15,000 with 44 and was called by Michael O’Grady with the suited AK. The flop fell 4A6 to give Rann a set but it also brought two hearts to give O’Grady some hope. The turn and river bricked as Rann survived to move to around 30,000 while O’Grady drops to 36,000. We’re down to 36 players remaining midway through Level 10. Among those still in the field are Billy Argyros, Minh Nguyen, Errolyn Strang, James Rann, Michael O’Grady, Chad Awerbuch, David Sebesfi, Michael Tran, Jimmy G, Khac Tran and Joel Cohen. Players have returned from their dinner break with blinds now at 500/1,000 and a 100 ante. The average stack is a touch under 40,000. The remaining 48 players are now on a 30-minute dinner break. There has been a flurry of action across the Star Poker Room over the past few minutes with multiple cries of “all-in … call”, but none has been more active than Table 74. Just moment after Chad Awerbuch sent Sam Khouiss to the rail, Andy Lee announced he was all-in from the button. Bassam Habib shoved over the top only for James Rann to insta-call! It was Lee’s QT against the TT of Rann and 99 of Habib with Rann looking good for the double elimination until a 9 spiked for Habib on the river! We caught the action on the turn with the board showing J525 and Rann all-in for his tournament life. Chad Awerbuch was deep in the tank, but he eventually made the call with 66 only to find himself behind the A5 of Rann. The river 2 filled Rann up to give him a much needed boost. There are still 53 remaining in the PMA 6-handed event, but the $330 Opening Event is down to its final two with overnight chip leaders Alex Lynskey and Daniel Tsui now heads-up for the $52,680 top prize. 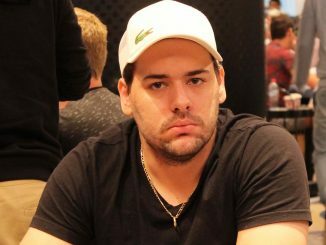 Lynskey, fresh from his fourth place finish in the Aussie Millions last month, is looking the good with about a 3:1 chip lead. Angelo Schiccitano shoved for his remaining 10,500 with KJdd and didn’t expect to be called by an opponent holding 78cc. He seemed to know exactly what was coming next though as he stood from his seat and watched the board fall 56Q8Q to end his tournament earlier than he’d hoped. Blinds are now at 400/800 with a 100 ante. There are 55 payers remaining. Laurence Hall stopped by our reporting desk on his way to the rail to tell us about his hot and cold day. It certainly began well – he was one of the early chip leaders after cracking AA with his pocket Qs and won a seat to this week’s $5,000 6-max in an all-in satellite – but his day is now over after his JJ failed to hold up against AK. We just noticed Reza Vakili heading to the rail and David Sebesfi stacking chips, however when we went to investigate it was Michael Tran nursing a monster stack of 75,000 to be the clear chip leader in the room. And while it Sebesfi that finished Vakili off, it was Tran that did most of the damage after taking down a series of pots in the lead-up. A short-stacked Chad Awerbuch got it all-in and in great shape holding KK against the A3 of fellow short-stack Timothy Ulmer and the A8 of Michael O’Grady who had them both easily covered. The board ran out 2J696 to send Ulmer to the rail while Awerbuch finally has some chips to work with after a slow start. With the re-entry period now over, the tournament staff here at The Star have been able to update the clock with the final number of entries reaching 126. There are 76 players remaining midway through Level 7. Trevor Saunders is another to have enjoyed a final table run at the Star Summer Series and he has just kick-started his tournament today to send an opponent to the rail. Saunders held A7dd and was one of three players to see a Td6d3c flop. He smelled something fishy when the original pre-flop raiser suddenly jammed for 13,000. He eventually made the call to fund himself up against QQ but with plenty of outs. The turn provided no help but the A on the river did as Saunders moves to 31,000. Sam Capra won this event during the Star Summer Series last December but he won’t be repeating the feat after being eliminated by former APT Philippines champion Khac Tran. Capra was all-in for his tournament life holding 99 against the QJ of Tran and looked in good shape when the flop fell 347, but a Q on the turn left him drawing thin and the 4 on the river ended his afternoon. Players have returned from their break to find blinds at 200/400 with a 50 ante and the re-entry period officially over. The tournament now reverts to a freezeout structure. 4.40pm: Time for a break! The remaining players are now on a 10-minute break. The tournament clock has ticked inside the final 10 minutes of the re-entry period, with 124 entries currently displayed on the board. Now would be the time for some of the short stacks to go hard or go home! Jimmy Ghobrial is making his presence felt as one of the big stacks in the room. We caught his most recent hand as one of three players to call an UTG raise. The flop came K88 and the UTG player bet 2,000. Another player called before Ghobrial bumped it up to 7,500. Both players folded. “I think I saved you some money there young man,” said Ghobrial as he increased his stack to 45,000. Dean Boskovic has scored a much-needed double at the hands of George Moussa. On a T387J, Boskovic shoved and was snap-called by Moussa who held 69 for the turned straight. However, it was Boskovic with 64cc that had rivered the flush to take down the pot. Blinds are up to 150/300 with a 25 ante. Re-entries will remain open until the end of this 40-minute level. David Sanis was one of the first players to use his re-entry today but he is making the most of his second chance, moving up to a very healthy 44,000. We caught his most recent hand on the turn of a 89QA board as Shivan Abdine bet 2,000. Sanis called to see a T land on the river. Both players checked with Abdine folding when Sanis showed AT for top two. Jehan Satchithananthan has just scored a healthy double at the expense of an unlucky Donald Civic. On a 9KJ flop, the chips found their way into the middle with Satchithananthan holding 99 to Civic’s KJ. The turn and river bricked and Satchithananthan moves to 32,000 while Civic finds himself struggling with just 6,000 remaining. Having fallen to 9,000 in chips, Michael Tran is suddenly back up to 25,000 after flopping a set with 99 on a 9TQ flop. One opponent couldn’t get away from his KK leaving Tran in decent shape to make a run. Blinds are now up to 100/200 with a 25 ante. Michael Tran is another late arrival and he is keen to gamble – to a point! Having agreed to get it all-in blind with an opponent who raised to 3,000, Tran re-raised to 6,000 but his opponent peeked at his cards before shoving. That forced Tran to look at his own holdings before mucking. He quickly drops to under 10,000! Billy “The Croc” Argyros has joined the field, which has now grown to 111 starters, but he is off to a poor start and is already down to 10,000. We’ve cracked the century mark with 107 players having now bought in. We’re currently in Level 4 with blinds at 100/200. Re-entry will remain open until the end of Level 6. Bassam Habib found himself short after running a boat into a bigger boat, but he has managed to double through to 20,000 the very next hand. Habib 3-bet his opponent’s 1,100 open to 2,600 then called the 4-bet shove to find himself in great shape with AK against his opponent’s KQ. The board ran out T-high to keep him alive. One of the more interesting tables during the early play today sees Michael Levy, Andy Lee and Jarryd Godena all seated together. Levy, of course, won the Star Summer Series in December for a career-high score of $173,250. Lee has also enjoyed success here, having won the inaugural Star Summer Series Main Event in 2011, while Godena took down the $5k 6-handed event at the recent Aussie Millions – one of three final tables he reached during his time in Melbourne! Cards are in the air once more! Level 3 is finished and players are on their first 10-minute break of the day! We’re 10 minutes away from our first 10-minute break of the day and we’re up to 98 starters in today’s event, including a handful of re-entries. Some of the more recent arrivals include Tam Truong, Robert Spano and Tony Kamboroglou. David Sanis has just been forced to buy back in after losing a huge pot when he ran AK into AA on a K-high board. Next hand he got his remaining chips in with 22 only to be counterfeited against an opponent’s AQ on a 57753 board. David Sebesfi made the final table for the Star Summer Series here in December and he has started pretty well today too. We sauntered past his table in time to see him betting 550 on a 39T4 board with three hearts. Michael O’Grady called. The river brought the 2h and this time Sebesfi bet 1,700 and O’Grady called but mucked when the former showed AhTh for the turned nuts. New players are gradually trickling in with Michael Kanaan, Andy Lee, Matt Rolfe, Errolyn Strang and Donald Civic among the recent arrivals. We are up to 80 runners. Blinds are up to 50/100. For the record, players have started today’s event with 15,000 staring stacks and blinds at 25/50. The first 40-minute level is about to come to an end with 66 players currently registered. It will likely be a few hours before the action starts heating up, so let’s take a moment to take in the charming surrounds of Star Poker’s latest temporary home. Regulars to this property would be well aware that poker has endured a nomadic past at The Star and having only located to its long term home in 2015, Star Poker has been forced to move again while full renovations are completed. We’ve been told that when complete, the Star Poker room will be as good as any going around – but this temporary home is pretty good too. Located alongside Cherry Bar on the city side of the main gaming floor, it is flooded in natural light during the daytime and boasts beautiful views out over Sydney Harbour and the iconic Sydney Harbour Bridge. Not a bad spot to spend the week! Michel Bouskila, David Sebesfi and Shivan Abdine are also in today’s field. Plenty of familiar faces are already piling in to take their seat in today’s event. Among the 61 players to have registered so far are Star Summer Series champion Michael Levy, Laurence Hall, Sam Capra, Peter Aristidou, Michael O’Grady, Chad Awerbuch, Sam Khouiss, Trevor Saunders and Jamal Ishac. The Star Poker tournament staff have announced “Shuffle up and deal” and we’re underway in the $1,100 PokerMedia Australia 6-handed event! Welcome to the inaugural Australasian Poker Championships! Good afternoon, Ben Blaschke with you here once again – welcome to PokerMedia Australia and our coverage of the very first Australasian Poker Challenge (APC) at The Star Poker Room in Sydney! 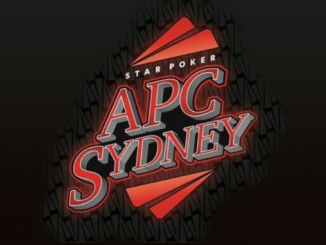 The APC is a brand new event on the local poker calendar and replaces the Sydney leg of the now defunct Australia New Zealand Poker Tour (ANZPT). The Main Event, which begins on Thursday, boasts a $2,200 buy-in and will be Australia’s largest repechage tournament with players able to buy-in to one or all of the three Day 1 flights. We will also be providing live coverage of the $5,000 6-handed event starting Wednesday, however we kick off proceedings today with the $1,100 PokerMedia Australia 6-handed event. 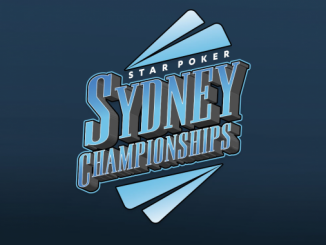 A popular event in recent poker series’ here at The Star including the Sydney Championships and Star Summer Series, the PMA 6-handed allows players one re-entry should they bust inside the first six levels. We’re not too far away from our 12.30pm start time so stay tuned to PokerMedia Australia as we bring you all today’s live action!